Profile 00: Heinkel He-219A-2 W.Nr. 290126 of 3./NJG3, Grove, May 1945 The uppersurfaces of W.Nr. 290126 were 76 with a reverse mottle of 75, while all undersurfaces and the vertical tail surfaces were matt black. The Werke Nummer appeared at the base of the fin in white, and the unit code D5+BL was applied to the fuselage sides in grey with the first two characters in reduced size and the 'B' outlined in white. While this profile has been reconstructed from the accompanying two photographs, it may be noted that when seen in its original Luftwaffe markings, the spinners had been removed and certain detail was hidden by the covers over the engines and cockpit. While the photograph of the machine in RAF markings shows most of these details, it is not certain if the aircraft's original spinners were refitted or whether those shown came from another machine. Similarly, all four dipoles for the FuG 220 SN-2 radar were angled at 45 degrees when the aircraft was first captured and painted black, although the two lower ones wre later replaced with examples painted white/red/white. The vertical aerials under the fuselage were for the FuG 25 IFF equipment and FuG 16 radio communications equipment, while the long fairing situated between these is believed to be associated with the FuG 12F blind landing system. Note also that there was no tail antenna but the two aerials for the FuG 101 radio altimeter were fitted under the starboard wing and a loop aerial was mounted on the upper rear fuselage. Photo’s 01-02: The same 75/76/black finish is repeated on this He-219A-2 which was surrendered at Grove in Denmark in May 1945. This particular machine, WNr. 290126, had served with 3./NJG3 and carried the operational code D5+BL on the fuselage. This aircraft was selected for ferrying to the UK and, as shown (Photo 2) all national insignia were painted out and replaced with RAF roundels. When later seen at Farnborough, the legend 'Air Ministry' had been painted on the rear fuselage in white capital letters with the white number '20' painted centrally beneath it. Profile 00: Heinkel He-219A-7 W.Nr. 310189 of 3./NJG3 which was surrendered at Grove in Denmark in May 1945. He 219 A W.Nr. 310 200 D5+DL. Probably an A-2. He 219 A W.Nr. 290 202. No code or type, although from its serial it would appear to be an A-2. It's the one preserved at Silver Hill, or whereever. 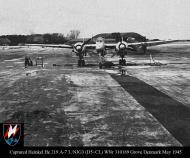 In his book "Wings of the Luftwaffe" Eric Brown mentions having ferried 3 He 219A-2s: W.Nr. 290 126, 310 109, and 310 106. An abbreviated version of this report on the He 219 is on pp. 155 of Remp's "He 219," and directly contradicts the type designation Remp gives to the He 219s he says were taken to the UK. He 219 A-2 W.Nr. 310 215. Mr. West mentions no codes for any of these aircraft, but states "they were possibly all at one time with I/NJG 1." Gunston, Bill. The Illustrated Encyclopedia of Combat Aircraft of World War II, Salamander Books, London, 1978. Kay, A L & Smith, J R. German Aircraft of the Second World War, Putnam Aeronautical Books, London, 2002. Mondey, David. The Hamlyn Concise Guide to Axis Aircraft of World War II, Bounty Books, London, 2006. Bridgeman, Leonard (editor). “Heinkel He 219.” Jane’s Fighting Aircraft of World War II. London: Studio, 1946. ISBN 1-85170-493-0. Chorley, W.R. Royal Air Force Bomber Command Losses of the Second World War, Volume 5 1944 - amendments and additions, Volume 6 1945 - amendments and additions. London: Ian Allen Publishing, 1997. ISBN 978-0904597912. Chorley, W.R. Royal Air Force Bomber Command Losses of the Second World War, Volume 6 1945 - amendments and additions. London: Ian Allen Publishing, 2004. ISBN 978-0904597929. Franks, Norman L.R. Royal Air Force Fighter Command Losses of the Second World War: Volume 3. Operational Losses: Aircraft and Crews 1944-1945 (Incorporating Air Defence Great Britain and 2nd TAF): 1944-1945. Hersham, Surrey, UK: Midland Publishing, 2000. ISBN 978-1857800937. Green, William and Gordon Swanborough. "Heinkel's Nocturnal Predator... The He 219". Air Enthusiast. Issue Forty, September–December 1989. Bromley, Kent:Tri-Service Press. pp. 8–19, 70–72. Greenhous, Brereton. The Crucible of War: 1939-1945. Toronto: University of Toronto Press, 1994. ISBN 0-80200-574-8. Kay, Anthony and John Richard Smith. German Aircraft of the Second World War: Including Helicopters and Missiles (Putnam's History of Aircraft). London: Putnam, 2002. ISBN 0-85177-920-4. Nowarra, Heinz J. Heinkel He 219 "Uhu". Atglen, PA: Schiffer Publishing Inc., 1989. ISBN 0-8874-0188-0. Remp, Roland. Heinkel He 219: An Illustrated History Of Germany's Premier Nightfighter. Atglen, PA: Schiffer Publishing Inc., 2007. ISBN 0-7643-1229-4. Smith, J.R. and Antony L. Kay. German Aircraft of the Second World War. London: Putnam, 1972. ISBN 1-85177-836-4.